"In the last few years, a handful of companies have started tuning into social media conversations to gather information on how people perceive movies and their stars. In a multi-billion dollar industry, where production budgets can top $200 million per film – and marketing budgets may soar just as high – insight into what people think about a leading man or blockbuster trailer is lucrative knowledge that, if harnessed, can flip a film from red to black." How is Hollywood using this data? As Scott Schlesinger observed in the Harvard Business Review in October of 2012, the data that Hollywood marketers scrape from "social media commentary and reviews of previous films [can be used] to compare actors, themes, genres, special effects, and current events. 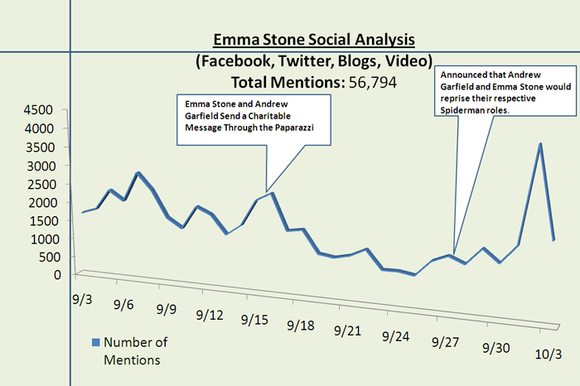 This might determine whether audiences have fatigue with an actor (such as [Spiderman's love-interest Emma] Stone, as displayed below) over recent months or weeks..." Leading perhaps to the re-editing of a trailer to de-emphasize the role of a star who isn't as hot as she used to be, or to play up the small role of a star on the rise. Poring over arcane charts and a pile of papers bearing statistics is nothing new in LA. Hollywood marketing execs have long relied on reams of data. For example, legendary producer Irving Thalberg famously recut early MGM talkies based on data collected at preview screenings. And in the years since then, many movie-biz hopefuls have found a first job in Hollywood gathering and analyzing audience data (full disclosure, my first job in Hollywood, over thirty years ago, was for a company that provided "audience sentiment" data - gathered from surveys and screenings - to the studios and television networks). These days, when studios spend upwards of $200 million to market global blockbusters, there is no question that some data-hungry Hollywood tub-thumpers have become pioneers in using the "sentiments" culled from vast amounts of tweets and posts to guide their movie marketing. 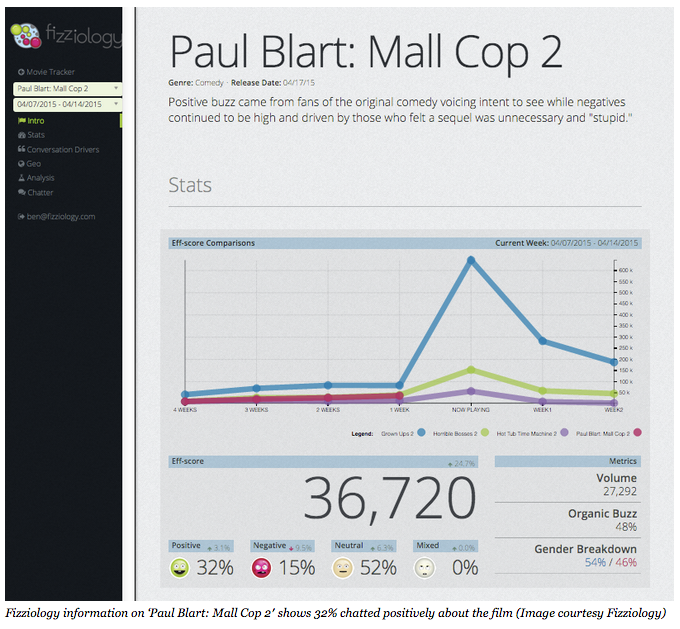 What types of data are Hollywood execs choosing to look at in the age of Facebook and Twitter? Is there a consensus about what numbers to track? What special insights (if any) can social media bring to the party? There does seem to be an emerging consensus in Hollywood marketing circles about which numbers to track. As David Herrin (head of research at the Hollywood talent agency UTA) says in Natalie Robehmed's Forbes article: "The holy trinity in social conversation is volume, a large conversation; sentiment, people saying good things; and an organic conversation that is consumer driven rather than from studios or press." 1) The number of posts created by the potential audience about a film's title or star as compared to some baseline (number of posts compared to some previous date or to posts about some other related subject = metric for Volume). 2) The "description words" used in relation to a film's title or star in social media posts (assigning a positive, negative, or neutral value to social media posts and then comparing the relative strength of positive, negative and neutral posts = one metric of Sentiment). 3) The number of times unpaid social media users mention a title or star in communications with others (while influencers can be paid to tweet or share your links, a content strategy that gets unpaid mentions should register on a metric for Organic buzz). Why are studios measuring things like volume, sentiment and organic buzz? Hollywood marketing execs know you're more likely to survive a plane crash than you are to click on a banner ad. (One marketing wag has even suggested an app that sends an ambulance to your home if you click on a banner ad, because the odds are you've suffered a medical emergency and hit your head on the "return" key.) In a world where conspicuous online ads are avoided, marketers increasingly seek ways to encourage what they call organic buzz (where content that lends itself to social sharing and engagement = Organic). Note: When marketers refer to a post as "organic," it tends to refer to the way the message spreads via social media (even if the studio paid to produce the original content). Of course, while studio marketers may feel comfortable calling a studio-produced message that spreads virally "organic," a skeptic might be appalled by their perversion of the meaning of the word. The goal for Hollywood marketers is to get people talking about a film - even if that means encouraging some key opinion leaders to spread studio-funded positive messages. The trick? Getting volume, positive sentiment and organic buzz without making the users overly aware of the brand's interest in spreading the messages via social media. Paradoxically, so far China has resisted the most intense forms of online manipulation as practiced by Hollywood marketers. Notably, China - the territory that already boasts the world’s most engaged social media audience and will soon be the biggest movie market in the world ("China could surpass the US as the largest theatrical box office market by 2018") - is not yet a big part of the studios' increasingly intense use of big data for movie marketing. The inability (so far) of the studios to gather and use big data from China may be attributable, at least in part, to fundamental differences in how movies are released in China and the difficulties Westerners experience in measuring sentiment online in China. Simply finding and reading posts related to your film in China's online ecosystem can be very tricky for Westerners. And, even if a studio employee can obtain good advice about which social media platform a given film's target audience might be using in China, measuring sentiment is tricky in Chinese. And Western copywriters can't just rely on Google Translate to transpose a Western campaign into Chinese. Language, cultural expectations and touchstones are very different. And it isn't just that idioms, cultural values and traditions of wordplay that make marketing movies in China challenging for Hollywood studios. There are fundamental differences in how films get released in China that can be traced back to a history of centralized control. As Pamela McClintock noted in an article that appeared in the August 8th, 2014 The Hollywood Reporter Magazine: "Ironically, marketing costs nearly nothing in China, the world's second-biggest market. The government's China Film Group pays for and runs a campaign, relying almost exclusively on the Internet since few moviegoers watch television." Have we crossed (are we about to cross?) the final frontier to Hollywood moviemaking guided primarily by automated tools for the measurement of mass sentiment instead of auteurist impulses? In other words: Beyond helping with marketing decisions, how far has the influence of the new tools - like online social sentiment - extended into the tinsel town decision-making process? Are movies getting made solely because Snapchat wants them? The answer to this last question isn't really clear. If social media has already begun making those decisions, why are shareholders paying Tom Rothman and Donna Langley so much money? The nightmare scenario of movies made on autopilot - if it comes to pass - will probably remain a closely-guarded secret. At least for a while. If only to protect the perks of being important in Hollywood. If you're thinking about spending time and money analyzing social media data, you can look to Hollywood to see what insights have proven meaningful and actionable.